One of the finest in the Carrera collection, the Tag Heuer Calibre 1887 Men’s Chronograph CAR2110.FC6266 is ready for any occasion. On the track, there’s a tachymeter bezel and 3 chrono counters. On the town, a black dial and alligator band elegantly contrast polished silver hands and indexes. Its beauty is simple: Luxurious style and performance in the absence of clutter. The black dial is fitted with 3 chronographic sub-dials at the 12, 6, and 9 o’clock positions that count minutes, hours, and small seconds. The ones at the 12 and 6 are spiral-engraved. Just inside the polished bezel and case, there’s a black flange marked with a white tachymeter scale for determining average speeds. Also black is the supple alligator skin. Under the hood is 39-ruby automatic Swiss movement with rapid date correction and 50-hour power reserve. The glass is scratch-resistant sapphire. 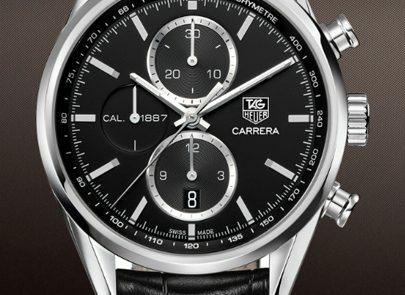 Like any Tag Heuer, with its high-end reputation, this watch doesn’t come cheap. The retail price of the Calibre 1887 Men’s Chronograph CAR2110.FC6266 is $4,300 from Tag Heuer, but you can save a $1,000 by getting it from a discount seller online. 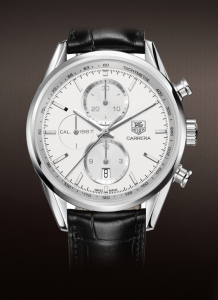 And this is just one example out of the 5 chronographs in the Carrera Calibre 1887 series. Others come with polished steel or brown alligator skin bands. The one to the right is identical apart from the white dial, which gives the watch more of a fine vintage style. 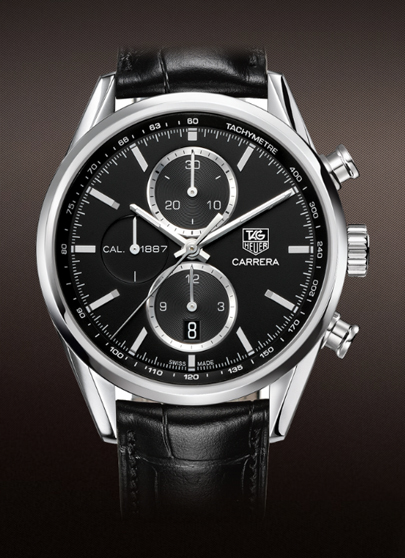 The Calibre 1887 is my favorite in the Carrera collection. It’s got everything I want in a timepiece: Classic style with sharp eye-catching design. 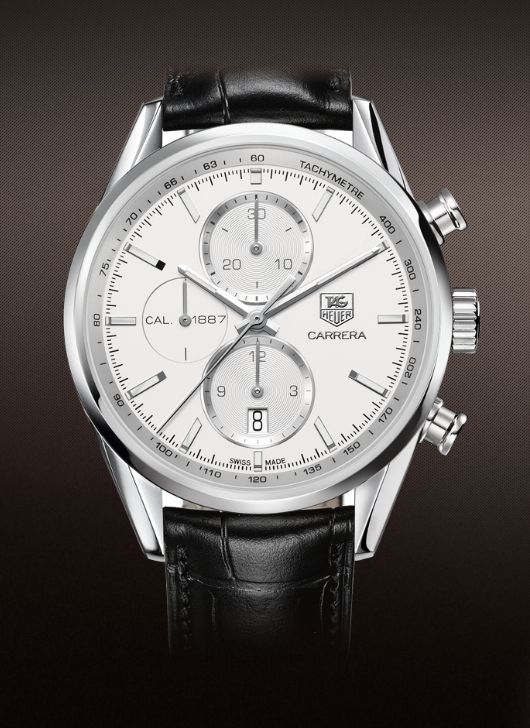 Clearly, when you buy the Calibre 1887 Men’s Chronograph CAR2110.FC6266 you’re buying more than just a chronograph. You can get a decent one anywhere. But a brand that can claim itself as the first chronograph in space and become famous for mechanical inventions in watch making aims for something more than decent. This watch doesn’t just look luxurious, it’s built that way. And it’s probably everything you’ll ever need. I’d worry more about whether it’s more than you need. Because this is a piece that will probably still keep good time when you hand it down to the next generation.